DETROIT TIGER STADIUM Empty photo picture art print photography for sale. EMPTY OLD DETROIT TIGER STADIUM photograph art prints photography photo for sale. This is a color photo that was made from an original black and white photo that was lightly hand colored and then artistically totally re-worked to create this very unique original visual effect of various contrasts and lighting at the old Detroit Tiger Stadium. The view here is looking out at the empty left field bleachers. It is a very unique architectural empty Detroit Tiger Stadium photo picture print taken during the last seasons of play at the Old Ballpark Detroit Tiger Stadium. You will see many other 'game' photos of the old Tiger Stadium, but very few of a totally empty DETROIT TIGER STADIUM photo print. 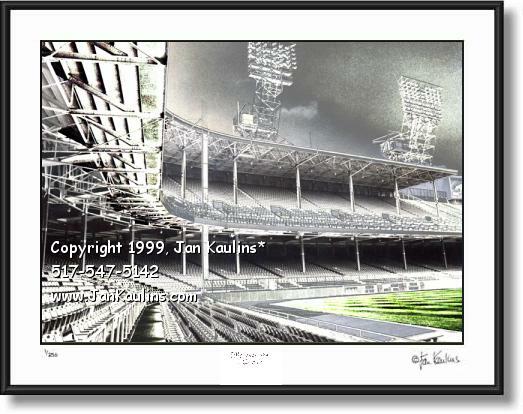 This is a very unique fine-art print of a fine Detroit Tiger Stadium artistic image. TO SEE THE MANY OTHER DETROIT PHOTOGRAPHS FOR SALE IN THE DETROIT PHOTO GALLERY, INCLUDING DETROIT AERIAL PHOTOS, DETROIT LANDMARKS, HISTORIC DETROIT PHOTOS AND DETROIT SPORTS PHOTOS, CLICK ON THE 'BACK TO...' LINK ABOVE THIS PHOTO NEAR THE TOP OF THIS PAGE.